The restaurant business has a language all its own. If you’ve never worked in a restaurant before some terms, like In the Weeds may not make sense. Here is a list of common restaurant terms that are handy to know, whether you are considering working in a restaurant or opening your own restaurant. Back of House– Refers to the area of a restaurant that guests are not allowed. The kitchen, dishwashing area and wait station are all located in the back of the house. Bar-back– An assistant for the bartender. A bar-back usually runs glasses through the dishwasher, stocks the coolers and liquor bottles, and pours beer, wine and non-alcoholic drinks for the wait staff. A bar-back can also double as a busser (below). Bussing– Term used for clearing off and resetting tables after guests have left. In busier restaurants this is done by the busboy (also called a busser). Chaffing Dish– A metal dish that is filled with water and kept warm with a candle or fuel cell underneath. These are typically used on buffets. Expediter– The kitchen staff who groups plated food together by table number, for the servers to deliver. Front of House– Refers to the area of a restaurant where guests are allowed. The dining room and bar are all in the front of the house. Read more about staffing for your front of house. Host/Hostess-The person who meets the guests and shows them to their table. The host is also responsible for keeping track of reservations and waiting lines. 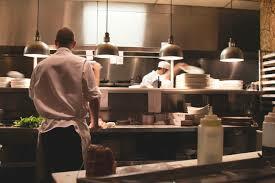 Line– The line is the area that divides the cooks from the wait staff. It is where the food is placed to await pickup. Read more about setting up your kitchen line. Mise en Place– Refers to the set up of the sauté station. Essentially, it means everything in its place. Most cooks put certain ingredients in a certain spot each shift (salt and pepper to the right, olive oil to the left). Plating– Putting the food on the plate is referred to plating. This includes adding any sauce or garnish before handing over to the expeditor or the server. POS System– A point of sale system is a computer system that helps businesses track sales. It also tracks employee sales (who sold the most during a shift) and which dishes are sold most often. Read more about how a POS system can benefit your restaurant. Sections– Many restaurant dining rooms are divided into sections, and each section goes to a particular wait staff each shift. Sharking– Luring an employee from one restaurant to another is called sharking. Turnover Rate– How fast tables empty and fill during a shift. A high turnover rate means more people have eaten and gone, while a slow turnover rate means the same people have been at the table for a long time, or the table is sitting empty.